― Ada Palmer, American author. “I didn’t know that people like you could play hockey,” he said. “What does ‘people like me’ mean?” I asked. “Well, you know… People who look like you,” he said, sounding less sure of himself. He wasn’t going to get off so lightly. I was determined to make him say it. Everyone around us fell silent. By now he was completely tongue-tied. My last comment had confused him, but there was nothing confusing about what he had meant. I felt humiliated and increasingly angry. “I don’t know,” came his meek response. I’d had enough. “Maybe next time you should think before you speak,” I said, and left. In my twenties, I was substantially overweight and was constantly subjected to “othering.” This exchange at a social hockey game was the last straw. I was done with keeping quiet when people treated me this way – assuming I was unintelligent, slow or lazy because I was overweight. When friends made plans there was always the guy who’d ask something like, “But what will the fat people do while we go skating/hiking/riding?” It was supposed to be funny, but it wasn’t. It was hurtful. Someone always found a way to emphasize the “otherness” of the two larger people in our friendship group. In my family it was a virtue to be skinny, too. You could be unkind, intolerant, immature, hurtful, gossipy – just as long as you weren’t fat. Family members would make remarks about my weight, and if I ever dared to respond, they didn’t think it was because I was human and hurting, but because I was jealous. I grew up hearing, “Sticks and stones may break my bones but words will never hurt me.” Well, I beg to differ. Sticks and stones can hurt you physically, but words can kill your soul. As I learned through my own experiences, pigeonholing someone because of one aspect of their appearance or character can lead to an insidious dehumanization of others. You can begin to see anyone from another race, culture, class, sexual orientation, or political belief as one of “them.” It sounds innocuous but the language is loaded, the words implying that all “those people” are wrong or fundamentally different in some way. Unfortunately, through our use of language, we have found many ways to treat people who are not in “our group” as inferior, or even dangerous. Othering is an easy way to make sense of the world, even if it’s not a very sensible way. Learning about people, and learning to accept them as they are (not as you want them to be) requires more energy than simply labeling them and putting them in a box. 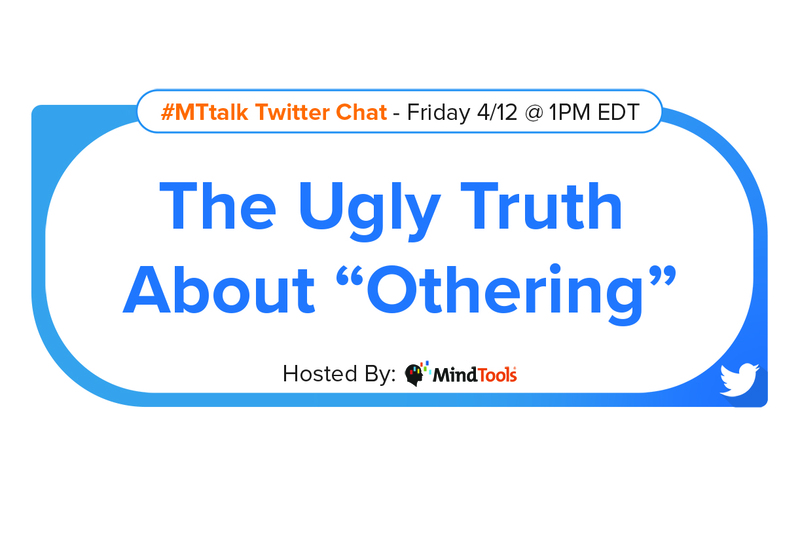 In our #MTtalk Twitter chat this week, we’re going to discuss the ugly truth about othering. In our Twitter poll, we asked what type of othering you’ve been subjected to in the workplace. Shockingly, 42 percent of participants voted for being othered based on their appearance. Only 14 percent experienced othering based on their qualifications. Author and trainer Dr. Eve Kedar (@kineretk) will be our guest contributor during this chat. We’re looking forward to welcoming her expert voice to #MTtalk! • What do you understand “othering” to mean? • Where does othering come from? Why does it occur? • In what ways do we engage in othering? • Why is othering so persistent? • Are you guilty of othering? • How do you embrace otherness? • What can leaders and managers do to address othering in the workplace? Follow us on Twitter to make sure you don’t miss out on any of the action this Friday! We’ll be tweeting out 10 questions during our hour-long chat. To participate in the chat, type #MTtalk in the Twitter search function. Then, click on “Latest” or “All Tweets” and you’ll be able to follow the live chat feed. You can join the chat by using the hashtag #MTtalk in your responses.